After visiting Colorado on Monday and Palma de Mallorca yesterday we are continuing our trip around the world by visiting Portugal today. 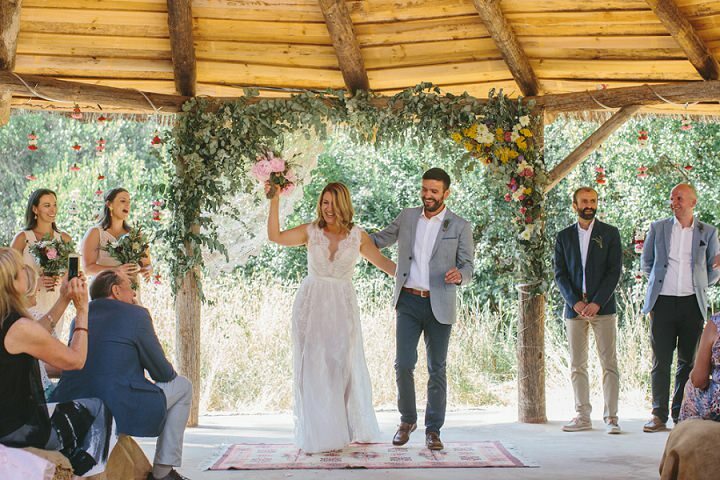 Karla and James decided on Portugal for their festival style wedding as it proved to be a fraction of the price than it would have been if they held it in the UK, plus look at all that gorgeous sunshine! What’s not to love! 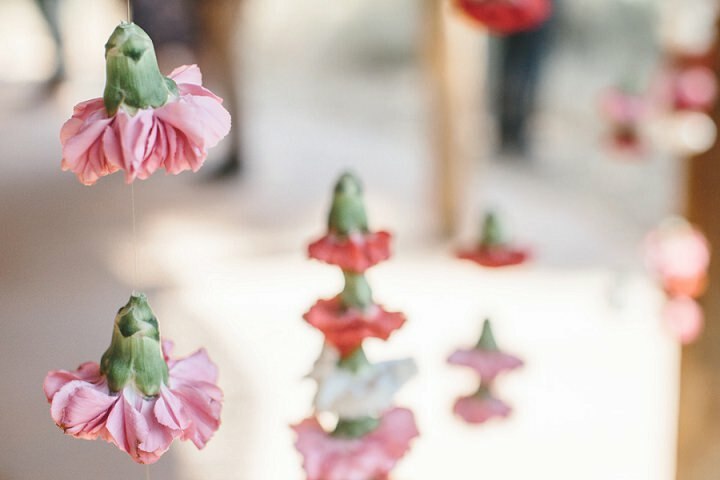 They filled their wedding ceremony and Rajasthan tent reception with lots of homemade details and decorations and enlisted friends and family to pull together to make their dream day a reality. The whole day has a beautiful bohemian laid back feel to it, plus that golden light is truly delightful. Big thanks to Ana Parker Photography for the lovely images. 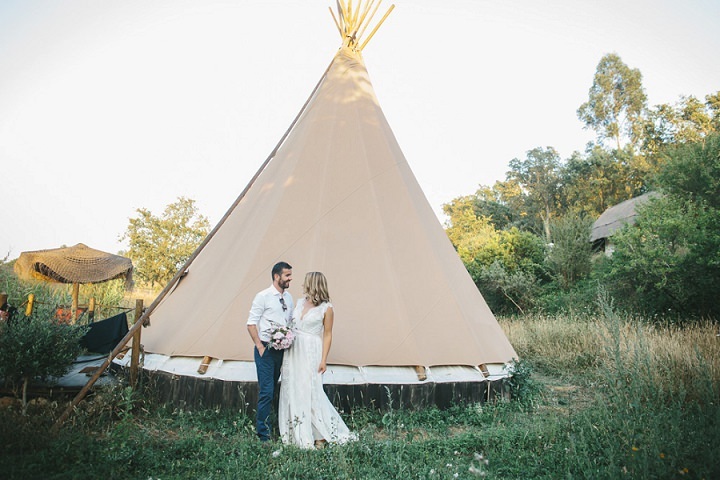 Karla and James were married on the 9th July 2016 at A Terra Eco Campsite in the Alentejo region of Portugal. 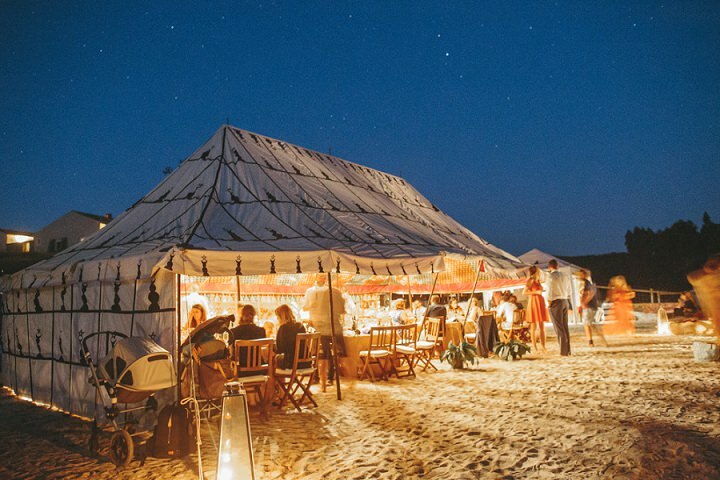 The ceremony was held under a wooden gazebo, with the reception meal and speeches in a beautiful Rajasthan tent, followed by dancing on the beach by the lake under the stars. 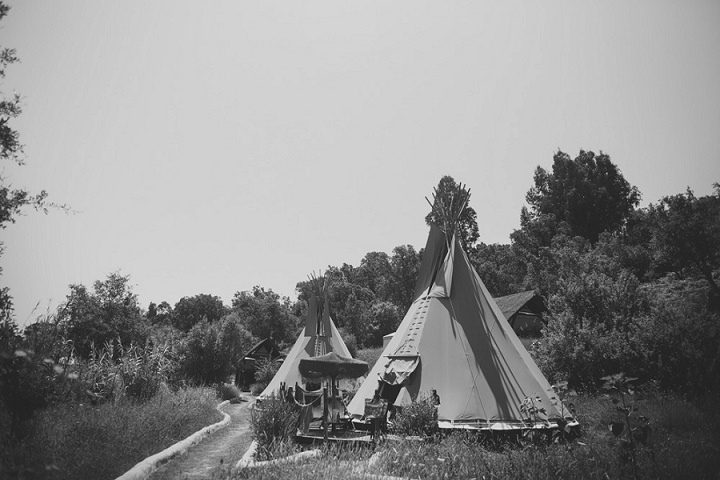 ‘We hired the whole site for 5 days, which has a range of beautiful yurts and tipis, along with some other nearby accommodation and our guests joined us for 3 or 4 nights. 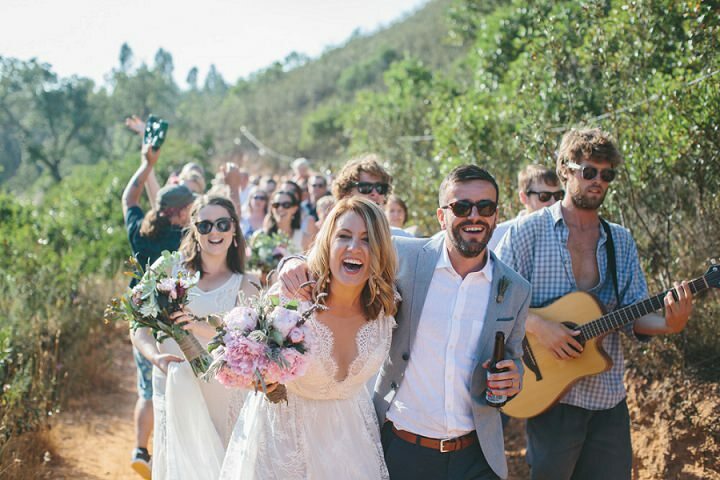 We knew we wanted an informal, relaxed wedding that met 4 criteria: Quality time with the people we love, no curfew, free flowing drinks, good music. We struggled to find venues in the UK which had the flexibility we we after. 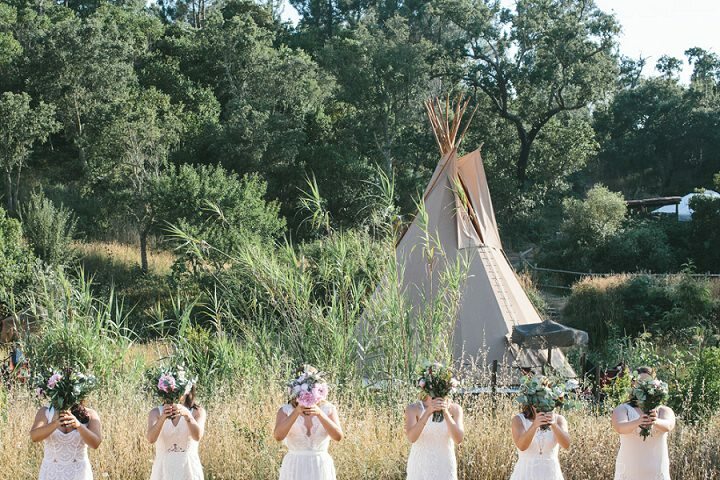 We loved the idea of a big tipi for the reception, but when we looked at the costs to hire one in the UK it was going to eat up the majority of our budget. 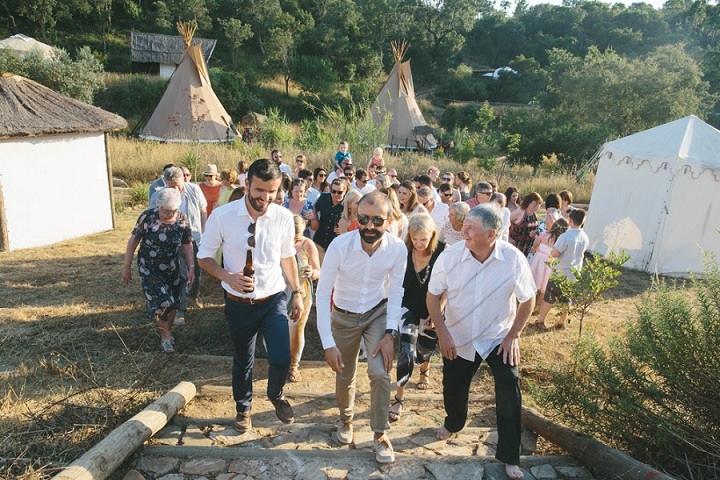 So when we discovered we could have a whole valley of tipis and yurts as well as a private lake with a beach and a beautiful Rajasthan tent for the reception in Portugal at a fraction of the cost we were sold! We had 70 guests and took about 10 months to plan. We met while James was visiting Australia (I am Australian) for the Ashes. We had one date before James flew back to the UK. I moved to the London about 8 months later which was pre-planned and after a few false starts we went to Glastonbury together and decided that if we can happily spend 5 nights together without a shower then their must be something in it! We have been together ever since which is just over 8 years. James proposed on a weekend away walking in the Lake District. We were sitting on a hill top overlooking the village of Buttermere and James said ‘So, are we going to do this forever thing?’ before getting on one knee, presenting me with a beautiful, unique vintage art deco ring and asking me to marry him. 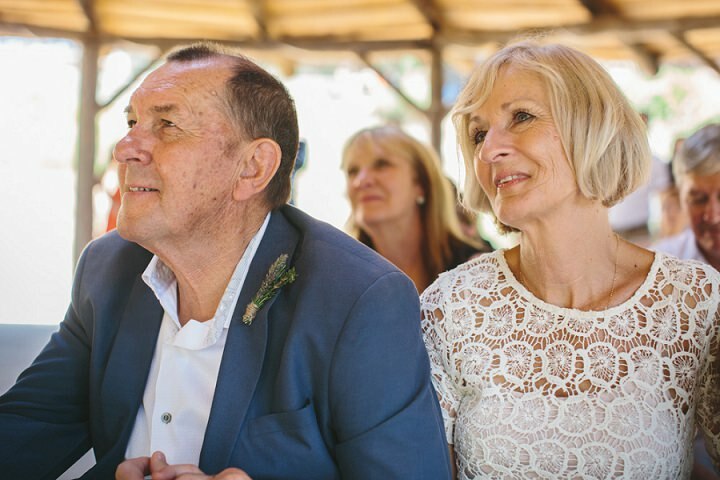 It was a complete surprise as we’d been together so long and I wasn’t sure we would ever get married. I was especially touched that he had picked the ring himself from a gorgeous local jewellery shop Lila’s, and had called to ask my dad’s permission which I know meant a lot to him. 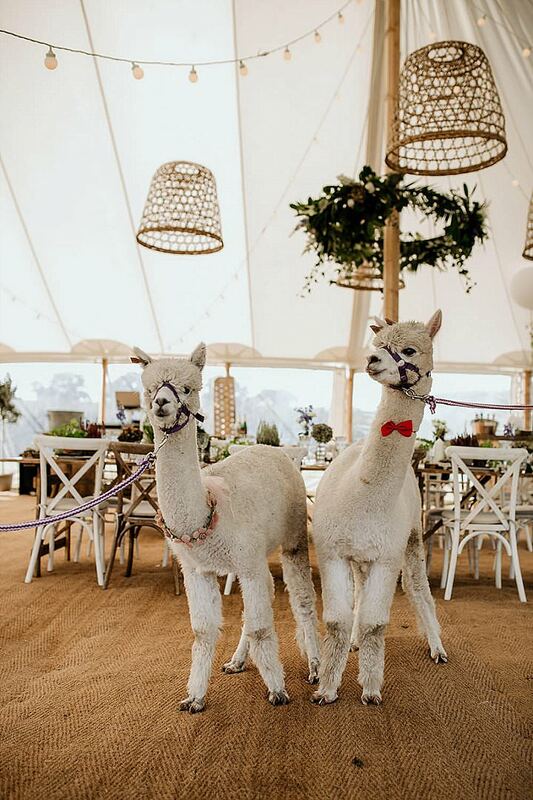 We wanted to keep the budget relatively low as we didn’t want the wedding to become too extravagant. 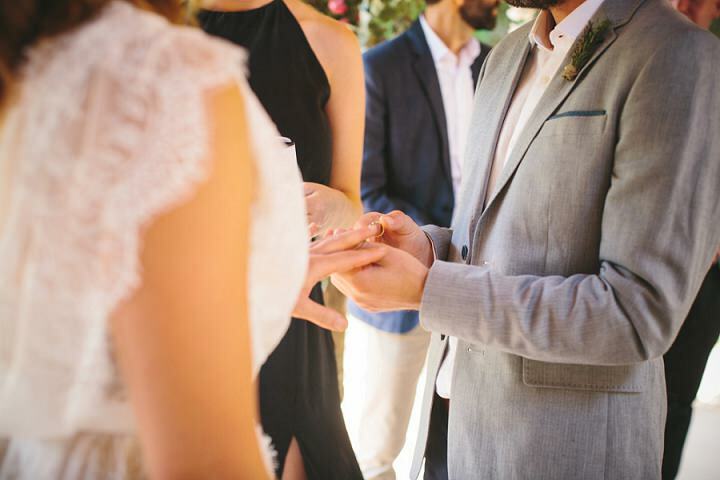 We were also conscious of not getting too caught up in the wedding itself as an event, but rather focusing on what it actually symbolises – we’re big believers that it is about the marriage, not the wedding. But that said, we also wanted to take this rare opportunity to bring our family and friends together from around the world to celebrate, so we found it a really hard balance to strike! 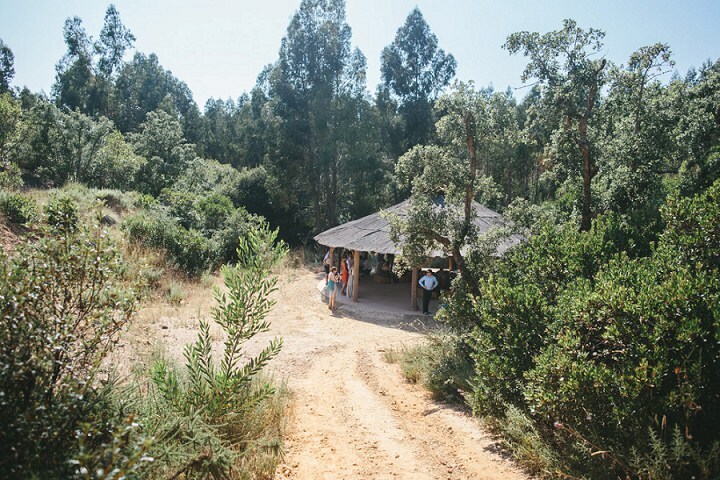 Our biggest cost was the venue which we hired for 5 nights and also doubled as accommodation for a number of our guests. 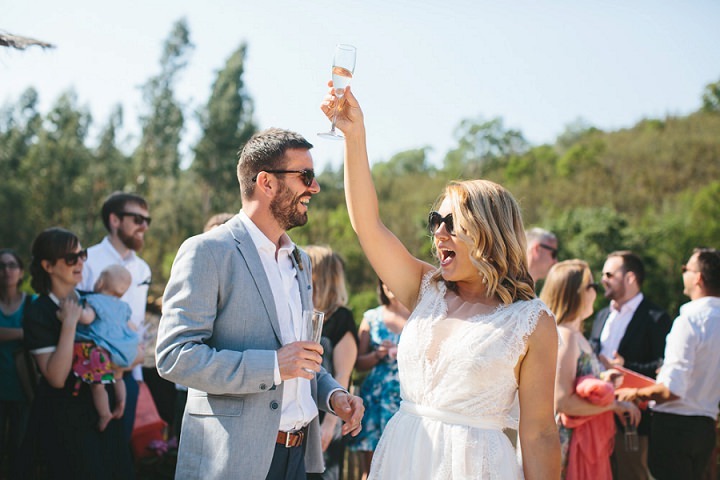 We managed to source an amazing local caterer relatively cheaply and we were able to supply most of the alcohol ourselves which saved on costs. 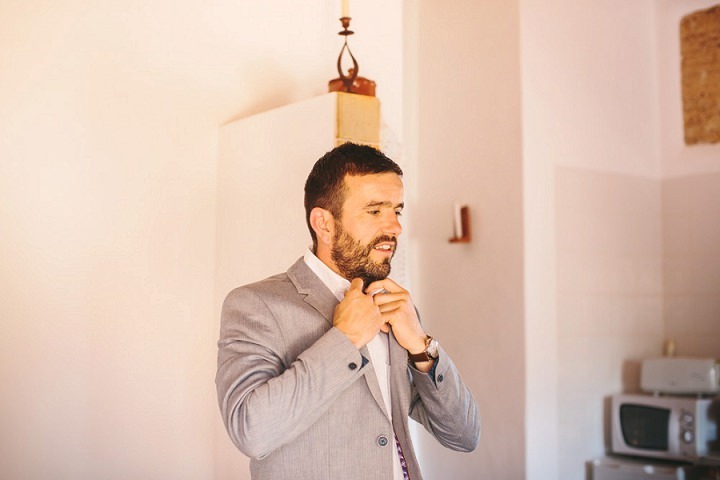 The best money we spent was definitely on Ana our photographer and our band ‘Off the Lip’ – both were relatively last minute decisions as we had originally listed these costs as extras but they were 2 of the best decisions we made! We didn’t really splurge on anything, but we are glad that we decided to have a professional photographer and a band. 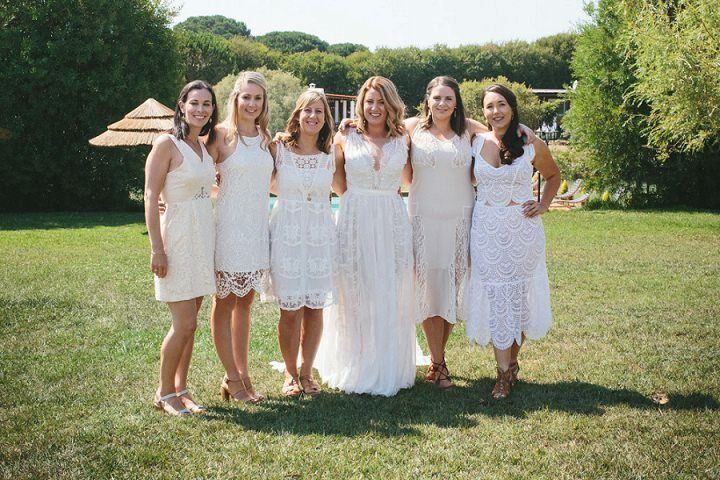 We did almost everything ourselves which saved us a lot of money, but it was challenging to source suppliers and arrange a wedding in Portugal from the UK without a wedding planner and while it saved money it almost cost us our sanity towards the end! But it was totally worth it. 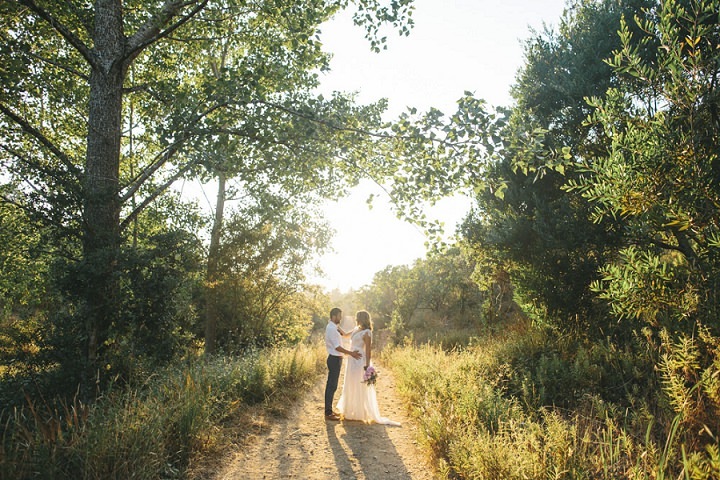 We actually found our wedding venue on Ana’s blog! 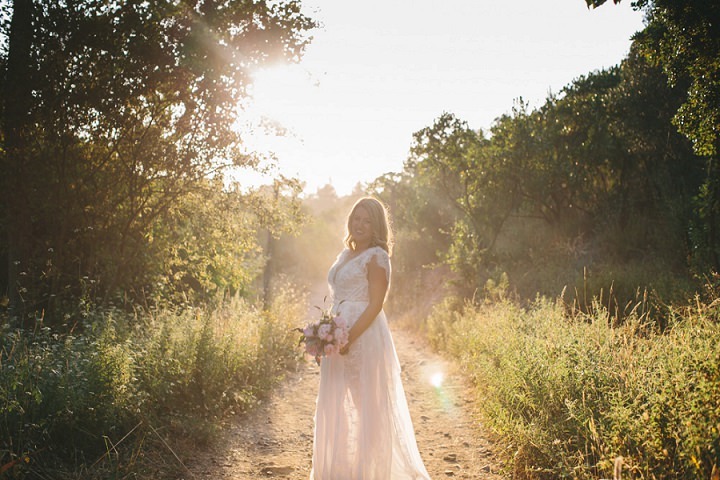 We absolutely feel in love with the photos of one of the weddings she had previously photographed at A Terra. 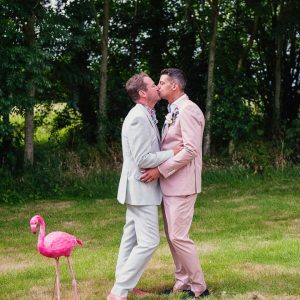 Once we had secured the venue we took a while to contact and book Ana as we weren’t sure whether or not we were going to have a professional photographer – we are SO happy we did! It was seriously the best money we spent. 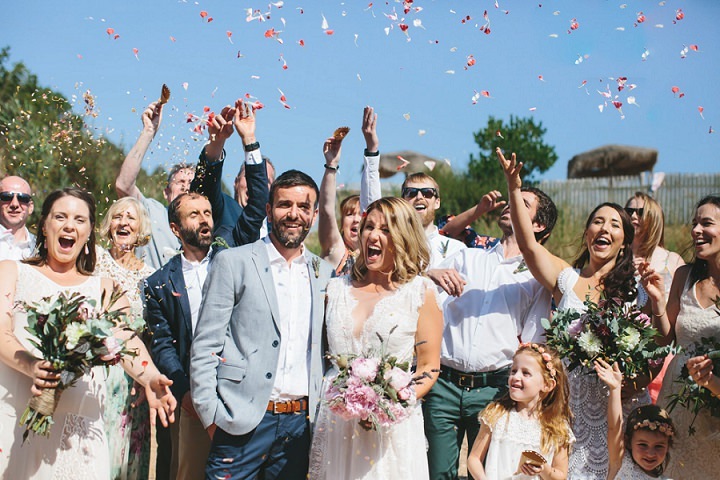 Ana was so easy to deal with in the lead up to the wedding, so wonderful to have around on the day and we are just over the moon with the photos! 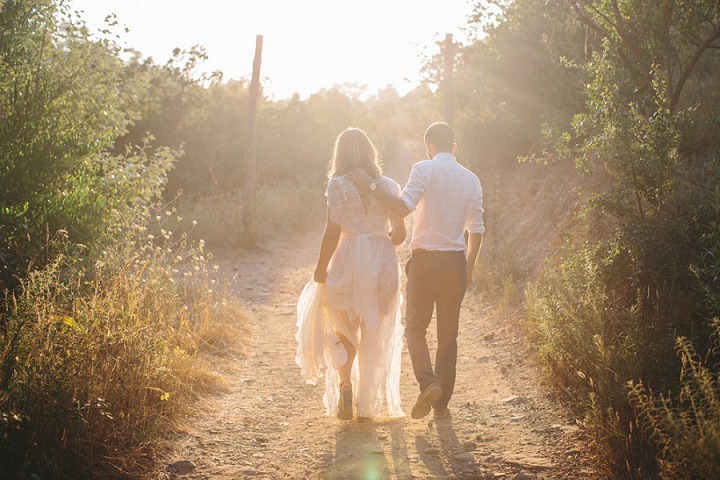 We love her reportage, natural photography style and her use of light. She was the perfect choice for our wedding. 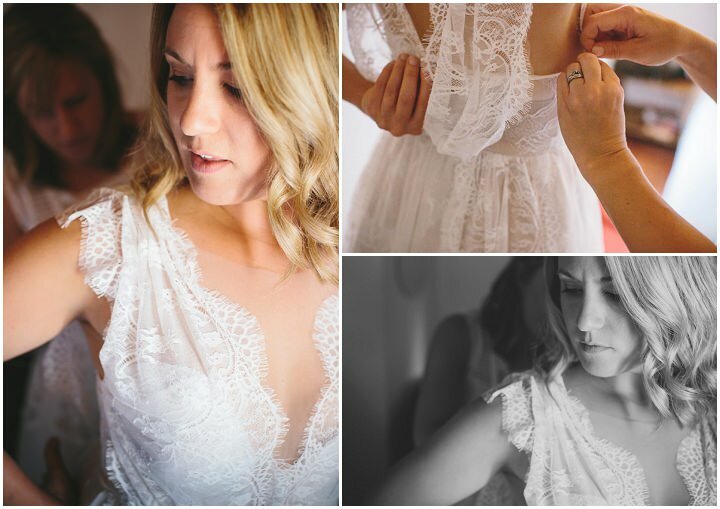 My dress was the Genevieve by Grace Loves Lace. I absolutely fell in love with their free-spirited style. I found my earrings in a little vintage jewellery shop in the Cork region of Ireland where James’ mother is from which made them a little more sentimental. 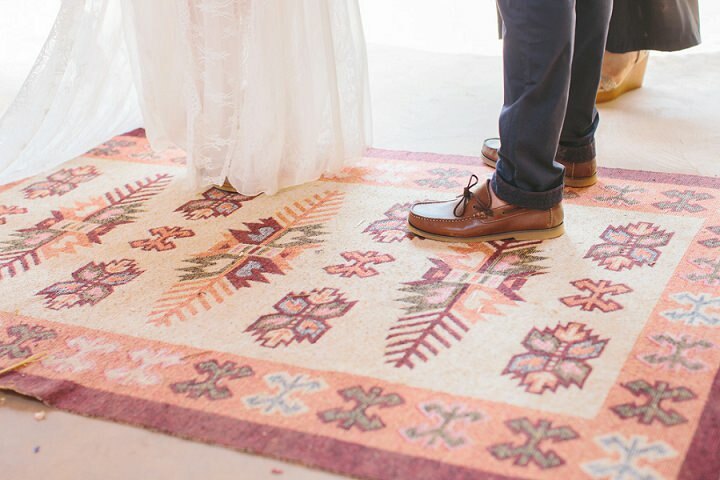 My shoes were a simple chunky heeled New Look Premium sandal (we were on dirt paths, sand and uneven ground for the whole wedding!). 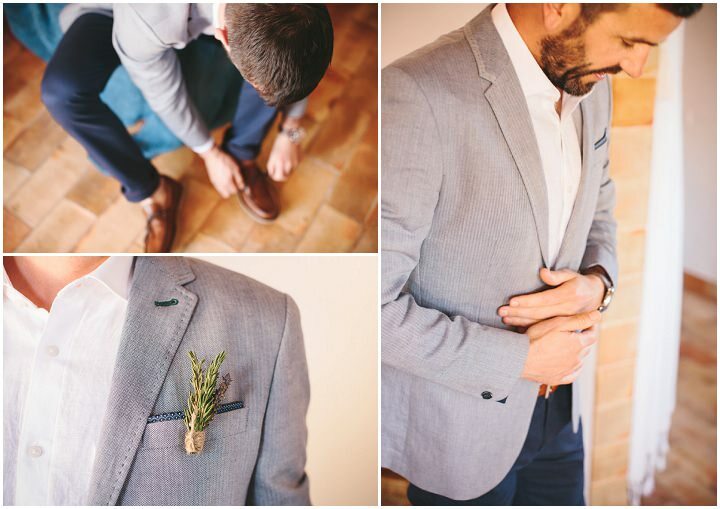 The suit jacket and chinos were by Ted Baker – it was the first thing James tired on! 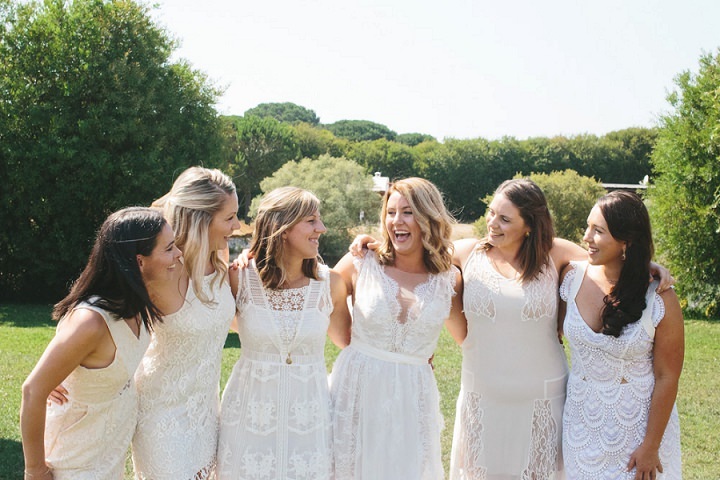 And the bridesmaids chose their own dresses based on a simple brief which worked together more perfectly than I could have imagined. 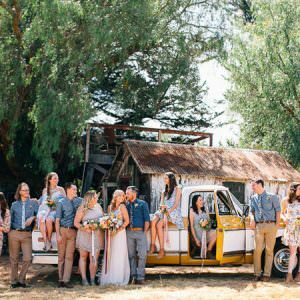 There was no colour scheme and not an intentional theme from the start, but I guess with the venue we found ourselves naturally leaning towards a bohemian, festival-style wedding. Flowers were challenge! 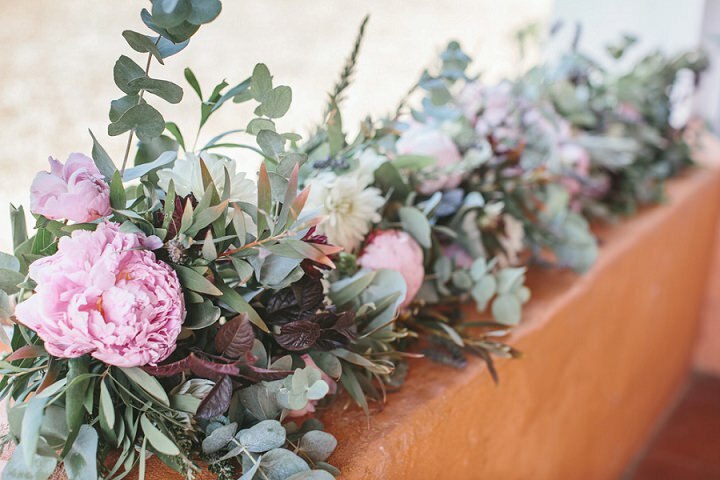 One of my amazing bridesmaids, Claire, and I share a love of flower arranging and we were keen to source the flowers and do the bouquets, flower arch and table decor ourselves. 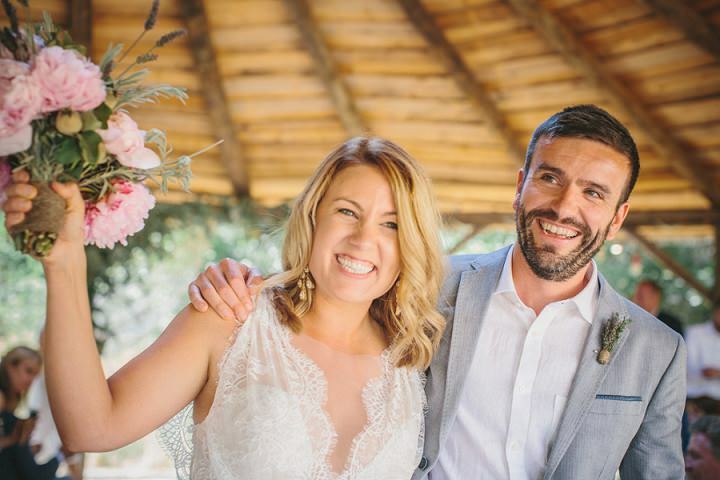 I had a couple of local suppliers fall through last minute which lead to Claire flying into Lisbon to pick up a car load of fresh cut flowers and drive them 3 hours to venue – just incredible! 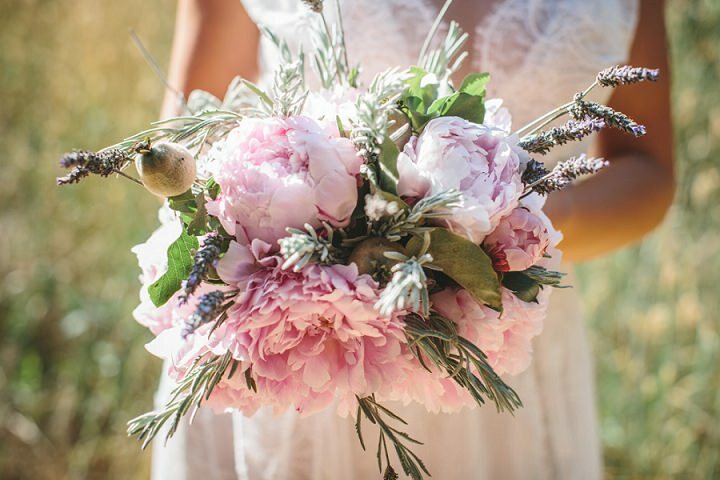 We had a mix of pink peonies, deep red and white dahlias, and red, white and pink carnations which we mixed with other wild flowers and foliage we picked from the local area including quince and lavender for the bridal bouquet, thistles for the table decorations and eucalypt for the flower arch. The venue and the scenery were SO gorgeous that it didn’t require too much decoration. We had an incredible flower arch in the gazebo which we were married under, with our living room rug as an alter piece! Either side of the arch we had strings of red, white and pink carnations forming a delicate curtain. 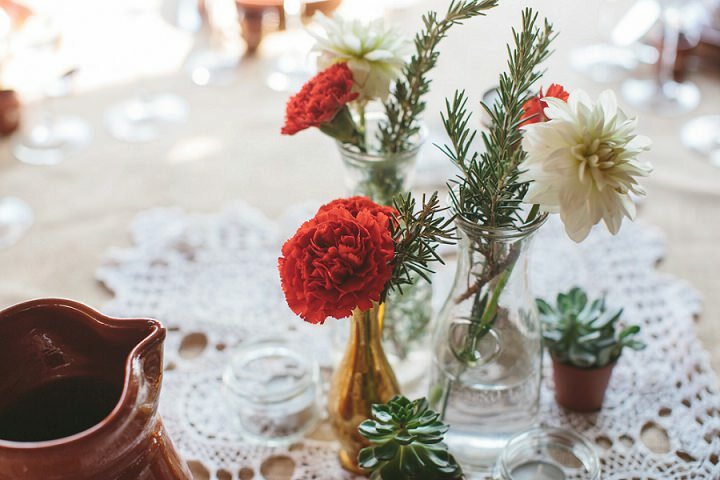 We had simple hessian table covers and natural terracotta crockery. 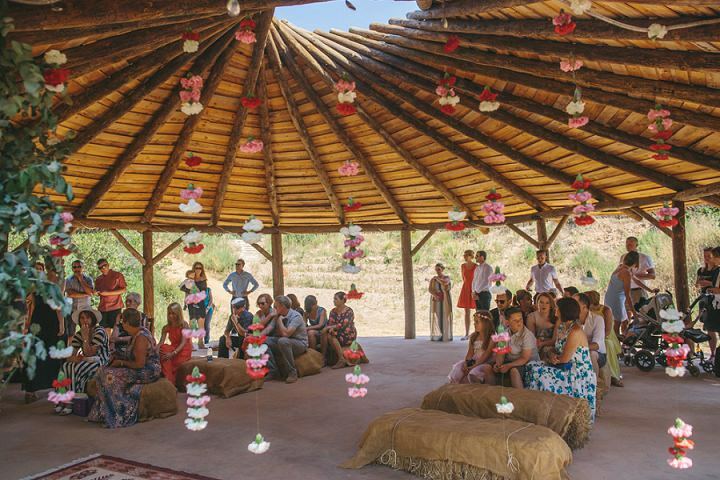 In the centre we scattered crocheted doilies which we topped with an eclectic mix of brass and glass vases, candle holder, jars and containers filled with a mix of flowers, candles and succulents to make up the centre pieces. This was all pulled together with the help of my incredible bridesmaids and my mum who spent hours making bouquets, stringing flowers onto gold thread, decorating tables, painting signs, and a building flower arches. 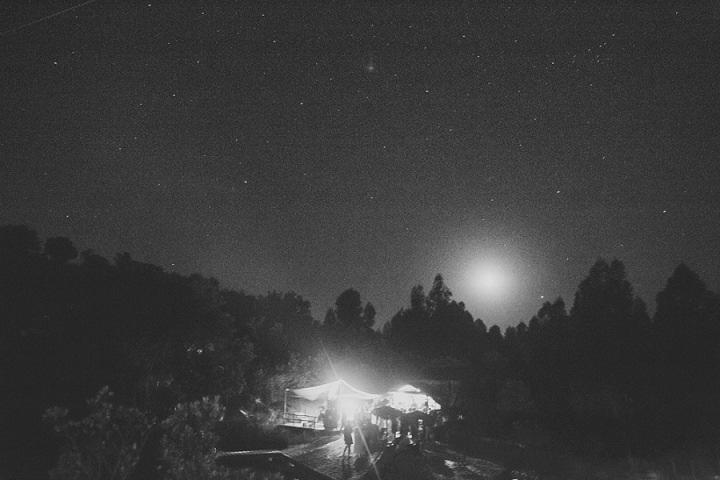 We were really blown away by, and grateful for the way everyone pitched in to make it happen. It was a truly communal effort. 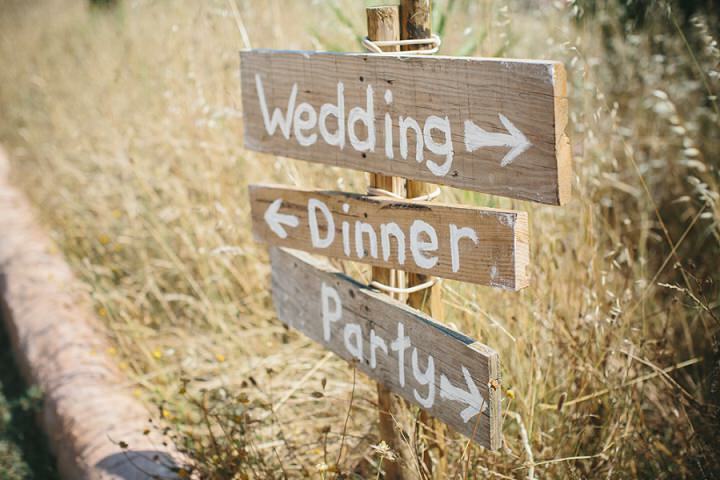 We found a wonderful local caterer through our venue who put on the most amazing spread with lots of local specialties! 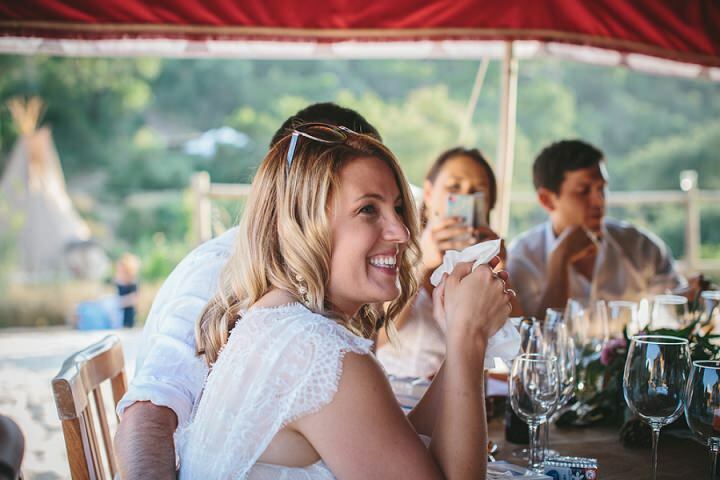 From yummy local Portuguese cheeses and meats, and tosta mistas for the canapés, to the roasted black pig and colourful salads and vegetables for dinner, to a massive fruit platter mixed with a selection of homemade cakes for dessert. All polished off with a glass of Port wine. We didn’t have a wedding cake BUT we did have an obligatory, massive pile of Portuguese Pastel de Natas. We had a fab local band called Off the Lip who played an acoustic set on the beach while we had canapes and champagne, before a more rocking set after dinner to get the party started. The were fantastic and so so great to work with. Love them. 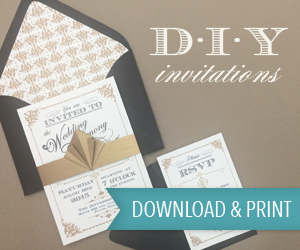 We sent a simple Save the Date using Paperless Post, then we created our own wedding website using Squarespace. 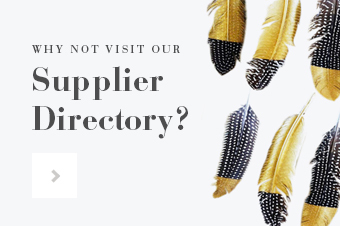 Which we found really easy to use and would recommend. One of our friends designed a K&J monogram for us which we used on the website and had it turned into stamps which we used to add personal touches to Portuguese postcard, and on labels for thank you gifts. He also designed a Wedfest Itinerary and map of the venue and area for us to give to guests when they arrived. Oh my god, the whole thing was so incredibly personal! We did everything ourselves from hair and make-up to decorations. 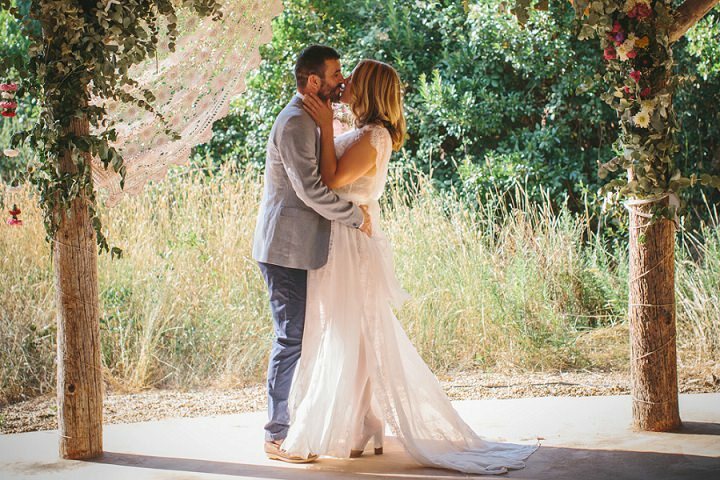 It was such a gift to be able to create our wedding with the people we love. 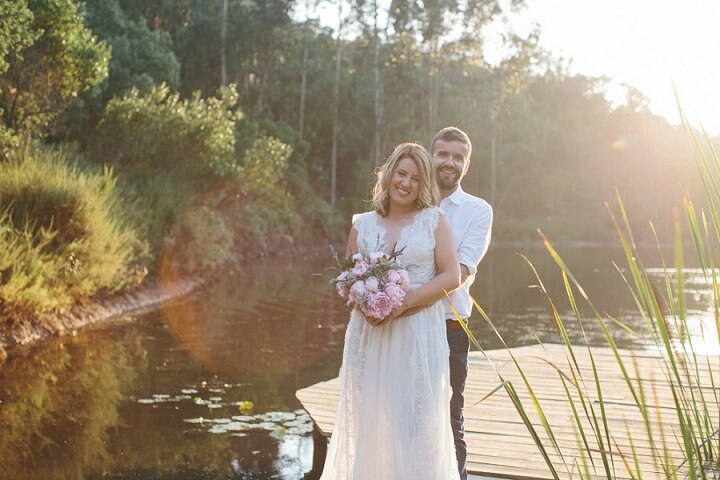 We were married by our dear friend Erica, who is a celebrant, which was super-special. 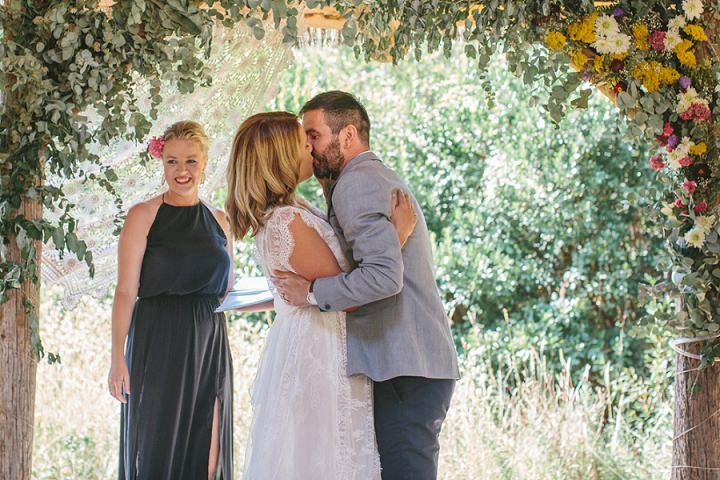 It made the ceremony so relaxed, personal and intimate. Two of our closest friends were our MCs and were a fantastic comedy duo. My mum had crocheted many doilies over the years which she sent over and we used in the alter under which we were married, and as table centre pieces. Mum also made my garter, which had an opal sewn on it which was my late Nan’s. 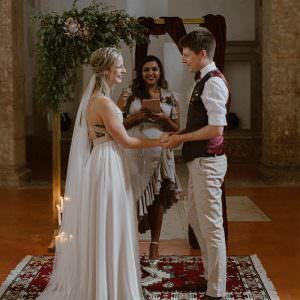 We also had a number of children and babies at the wedding, some of who we were meeting for the first time, as they had travelled form as far as the UAE and Australia, which really was so special and added another dimension. And our friends from Australia who were not able to make it produced the most gorgeous video which was played for us at the wedding. If I had to pick one it would be the ‘Caravan of Love’ processional! The ceremony and reception areas were about 5 mins walk apart and we were a bit worried about how we would get everyone to move to the Rajasthan tent for dinner after the canapés and champers. We had this vision of everyone in a procession singing ‘Caravan of Love’ by the Housemartins a cappella but never thought it would actually happen! We mentioned it to the band and they made it happen – playing the bongos and singing, getting the crowd to join in as we walked along the lake. It was brilliant! James’ speech – he is not known for speaking in front of crowds but he got up there, mic in hand, no notes, his nephew supporting by holding up ‘Laugh’, ‘Cry’, ‘Boo’ and ‘Applause’ cards for the audience, worked the room, was funny, sentimental and such a natural! Awesome photography and decorations, nice locations, congratulations..!!! 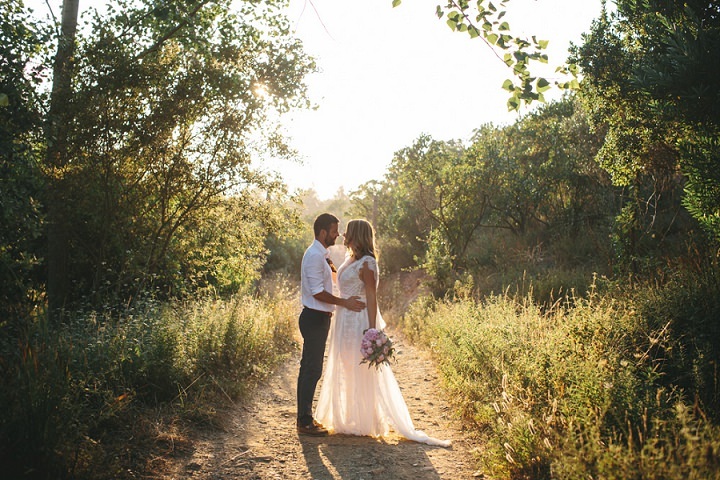 Love this totally relaxed and natural atmosphere… people in love, that is clear! Really a nice story to watch! 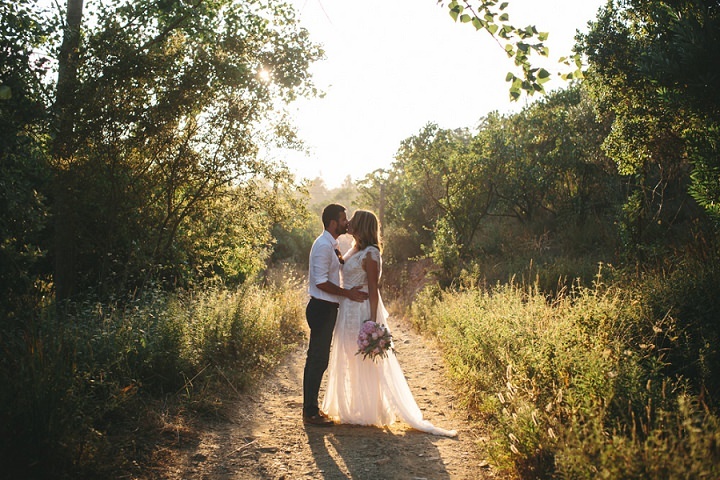 Really stunning wedding. A huge congratulations to the couple which looked like a fantastic day.